Is This All Slots Casino Free Cash Flyer Legitimate? - Casino Answers! Casino Answers » Misc Casino Questions » Is This All Slots Casino Free Cash Flyer Legitimate? Is This All Slots Casino Free Cash Flyer Legitimate? 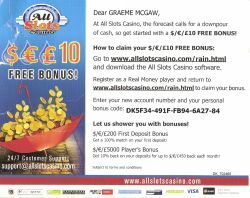 During the last two weeks of March you may have received a flyer in the mail from the online casino All Slots Casino. 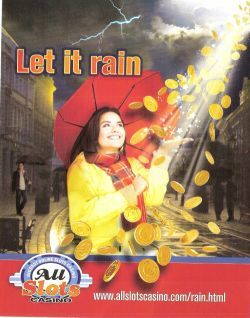 Here is a picture of the flyerPlay at this years #1 online casino for United States - Slots.LV. The flyer states that it will provide all new All Slots Casino players with a free cash bonus. The free cash amount stated is 10, and is available in either euros, sterling or pounds. The exact free amount will depend on which country you are from, and what currency you use to register with. This is a legitimate mailer. I even wrote a casino blog about my play with with the free money. Each casino flyer also offers a bonus code which appears to be unique, although you can give ours a try for sure and see if you get the free cash. Even if you don’t apply for the free 10 credits, you are still eligible for the All Slots Casino bonuses. All Slots Casino offer two separate bonuses. A 100% to 200 first deposit bonus, followed by a special players bonus of 10% back on all deposits each month, up to 450 in free cash in the currency of your choosing. To take advantages of the free cash bonuses visit All Slots Casino today. What is the all slots personal bonus code I should use for the free 10 credits? To test out these coupon codes, you first have to visit All Slots Casino, download the software and register an account. Once you have done so, you enter your account number and the coupon code at this URL. It states that it will take 3 hours to be credited the cash, however when we did our blog it was credited immediately. Is All Slots Casino a secure casino? Is this casino mailer I received safe? Is this brochure I received in the mail a scam?